It's mind-blowing that almost half the world -- almost 3 billion people -- live on $2.50 a day or less. More than one billion people live on $1 a day or less. This book explains how these families invest their money to best support themselves. I hope reading this provides some insight into ways we can all work to support them better as well. Nearly forty percent of humanity lives on an average of two dollars a day or less. If you've never had to survive on an income so small, it is hard to imagine. How would you put food on the table, afford a home, and educate your children? How would you handle emergencies and old age? Every day, more than a billion people around the world must answer these questions. 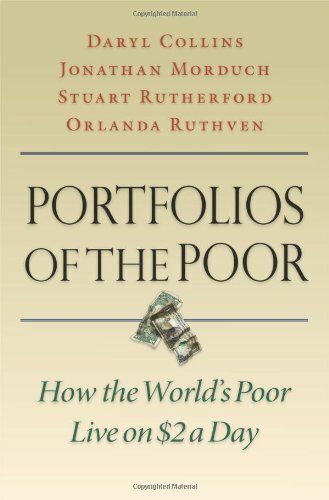 Portfolios of the Poor is the first book to systematically explain how the poor find solutions to their everyday financial problems. Get notified when book 18 is available by joining the club.